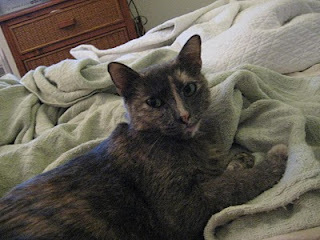 While I have been honest about my-less-than-satisfying relationship with Delilah (hereinafter "Delilah Bug"), I was usually just teasing about getting another cat (specifically one who likes me). My tendency was towards a kitten, presuming that Delilah would tolerate the addition of a kitten without much threat. But that is not what happened. Macy Grey f/k/a Gypsy is what happened. She was a stray hanging around a friend's house (because she was getting fed). Macy is actually on Petfinder.com as Gypsy and you can read her short little bio there. My friend suggested that Macy might be a suitable second cat for us. I considered that Delilah would never be able to accept a full grown cat in her house, but I agreed to give Macy at least a two-week trial.